For awhile there, I thought that they had inexplicably ignored MyLai, but I had forgotten that it was covered up for several years before it became public knowledge in 1970. That, and the Kent State section made this a really hard watch. Very, very emotional. It all really brought back what it felt to be living at that time. I was 12 at the time of Kent State, but I was, even at that age, keenly aware of what was happening in the country, caught between the "America, Love it of Leave it" stance of my parents and the fear and anxiety (and largely anti-war stance) of those just a few years older than me, who were of draft age. I recall watching the '68 Chicago riots on tv with my father and him saying something to the effect of "If I ever see you like that, don't bother coming back home." He pretty much made me anti-war with that comment, at the tender age of 10. FWIW, the founding members of DEVO were Kent State students at the time. They've often cited the shootings as furthering impetus for their de-evolution concept. Perhaps the bleakest episode yet, mainly because of how obvious it is that the divisions within American society depicted here have never been repaired, and are as raw and inflamed today as ever. I've noticed the filmmakers have started to repeat interview footage shown earlier in the series. I guess they're hoping that the additional context somehow illuminates these sequences, but I just find it kind of jarring. Takes me out of the moment. On the other hand, it was interesting to see them quote scenes from the famous Woodstock documentary, but then cut in combat footage with it. That was an effective juxtaposition. I kept hoping they were gonna go all the way and do the split-screen effect. I've noticed the filmmakers have started to repeat interview footage shown earlier in the series. Yeah, I've noticed that, too. It is a little jarring, making you think you're having a moment of deja-vu. To me, it almost makes it feel like they didn't have enough interview footage and had to repeat pieces here and there. I've noticed the filmmakers have started to repeat interview footage shown earlier in the series. I guess they're hoping that the additional context somehow illuminates these sequences, but I just find it kind of jarring. It was jarring to me at first and I thought the same thing for a moment, and certainly it would be easy to repeat things when you've edited down the work and it's still 18 hours. But I think (well it's probably obvious) that it's purposeful and really adds to it. But that may be easy for me to say because I'm a hip hop head. Samples, used, reused, referenced, recontextualized and interpolations and even samples of interpolations of previous samples. It just makes the work more dense, to me. Some of the things that are said feel one way when you first see them, and then later on when they're said again, feel differently. 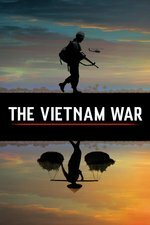 When they first showed that one guy talking about walking through vietnam, and how simply putting one foot in front of the other was an act of courage, I'm pretty sure they hadn't talked about mines like they did here, and go into depth about death stats from mines. So it had one general meaning then, and it felt a certain way. Then when they replayed that moment again, and played more of him talking about how it isn't an act of courage to walk to the grocery store in Sioux City, Iowa, yet here in Vietnam just putting one foot in front of the other was bravery - it was different. This time you could just imagine that with every step, that stepping leg could be blown off. At any rate, you get the point. For me, the Kent State footage was sad. The Massacre images and information was just disturbing. When Morley Safer did that interview and the soldier just talked about shooting babies, that was super, super disturbing. I feel like I'm watching something that some of us will point to as a "those who forget history are condemned to repeat it" moment. For all the unique things that have happened here, you can just sense the current American administration poised to take us down these dark roads yet again, and even further.